It’s been 20 days since I’ve posted and I can’t even begin to describe you how quickly this month has gone by for me. Last weekend I got married (yay!) and (mostly) finished a 7-month home renovation. Needless to say, my life has been insanely overwhelming and stressful and I am pretty thrilled it’s calmed down as much as it has. Of course I would have loved to re-live our wedding weekend over and over again, but we are slowly adjusting to normal life again. I plan on writing all about our wedding soon, but in the meantime I wanted to post this ridiculously simple and delicious dish for you all and end my mini blogging hiatus! This recipe was inspired by the geniuses of Primal Kitchen Foods and uses their delicious avocado oil! Avocado oil is fantastic for cooking at high temps and is super high in antioxidants, minerals, vitamin E and has the highest concentration of heart healthy monounsaturated fats. If you’ve been looking for a nutrient-dense oil that can be heated to high temps, but don’t love the taste of coconut oil, avocado oil is definitely your answer. It’s pretty mild and can be used in basically any cooking preparation. The easiest way to prepare spiralized zucchini noodles is with a Spiralizer. You can also julienne the zucchini but for only $30 on Amazon, a spiralizer is a really amazing investment for anyone on a whole food, paleo or gluten free diet. Stay tuned over the next few weeks because I will be posting about SO much that’s been waiting in the wings… a recap of our wedding, Part 2 of my health story and more TBD! This coming weekend I will also be heading to Paleo f(x) in Austin, TX so comment below if you’re going, I would love to meet up! If you aren’t planning on attending, be sure to follow me on Instagram and Snapchat (username: “anyakaats”) to see all the behind the scenes fun! Spiralize the zucchinis using a spiralizer and place noodles into a colander. Gently sprinkle salt over the noodles and allow them to sit while you make the rest of the dish. This will drain the zucchini of a lot of it's liquid. 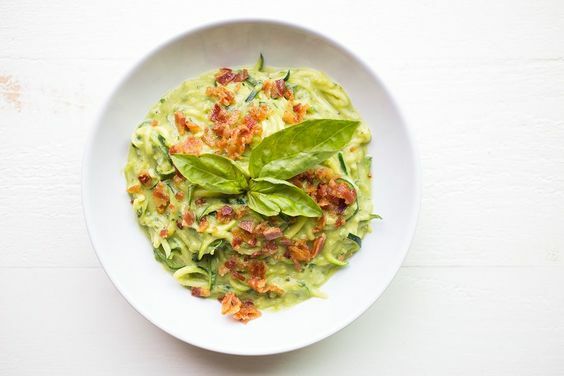 While the zucchini noodles are draining, place 3 strips of bacon into the oven on a parchment lined baking sheet and cook for 15-20 minutes. 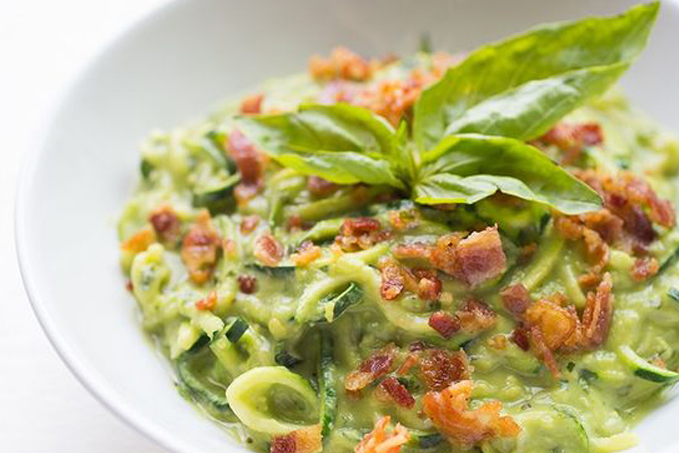 In a bowl combine the avocado, smashed garlic cloves, coconut milk, lemon juice, 2 teaspoons of avocado oil and basil. Mix well and add salt and pepper, to taste. Use a fork to ensure the sauce is smooth. It doesn't have to be perfect, but all the ingredients should be fully combined. On medium high, heat 1-2 tablespoons of avocado oil in a pan in preparation for cooking the noodles. Remove the zucchini noodles from the colander and place into the heated pan. Cook for only 2-3 minutes until gently softened. Add the sauce into the pan and cook for another 1-2 minutes. The noodles should be slightly softer but should still have a bit of a crunch. Be careful not to overcook them! 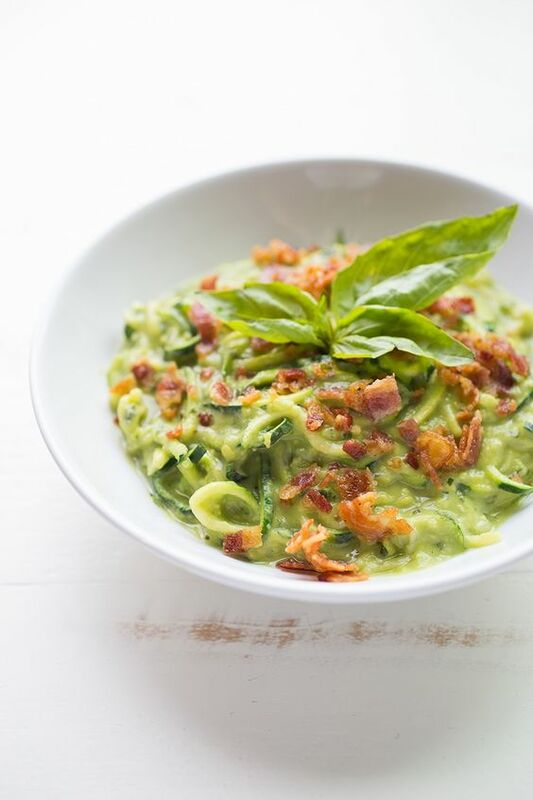 Remove zucchini noodles with sauce from the pan and divide into 2-3 bowls. Remove bacon from oven and allow to cool for 1-2 minutes. With your hands, gently crumble bacon on top of your noodles and enjoy! All I can say is YES! This looks so amazing! Pinning for very soon! I saw this on the Whole30 Insta and made it tonight. So delicious! I pureed the sauce in the NutriBullet, did the bacon on the stove so I could cook the noodles in the fat and we added shredded chicken. My non-paleo husband loved it:) Thank you!!! You’re so welcome, Wendy! Your husband has good taste. 🙂 This is one of my favorite dishes!! Where do I find cocont milk? This recipe sounds SO wonderful!!! Thank you! Most grocery stores carry it!